Earlier this week, Anonymous sent out a tweet relating an alleged interaction between Frank Ancona, the self-described “Imperial Wizard of the Traditionalist American Knights,” and a fellow KKK member. In the missive, Ancona allegedly said those wandering around rural Missouri in a Guy Fawkes mask could “accidentally” find themselves in a hunter’s crosshairs. “Its deer hunting season here in southern Missouri, it’s really easy to see how a hunter could mistake someone wearing one of those gay anonymous masks for the hind-end of a whitetail deer. Boom!!! Oops sorry it was an accident,” the message reads. The masks really come off in the next message attributed to Ancona, with unveiled threats of violence and racist invective directed at the hacker collective. The message claims the names of several Anonymous members have already been obtained, including that of “Commander X,” described as ”The Grand Wizard Of Anonymous,” and another member operating under the handle @TrezSec. On Wednesday, individuals claiming to be affiliated with Anonymous sent a video to News2Share saying they took the the statement as "a direct threat on our lives" that they would not stand for. The video continued that hacktivists would employ every means necessary to defend themselves. "If you attempt to aid the police [in the event of further civil unrest in Ferguson], just know that there are more of us out there than there are of you. But you will not know who we are. We are everywhere. We are among the protesters and we are even among you. Your violent ideology will not prevail in this fight." “You man have the guns and badges, but when you are on the side of the KKK, history will not look back on you kindly. 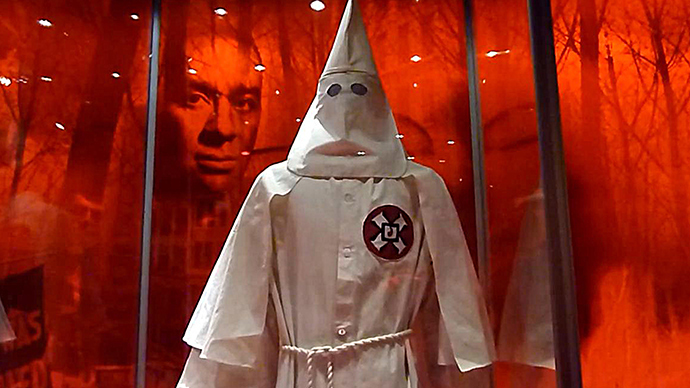 The two groups with a penchant for face-covering apparel began engaging in a perhaps unequal “cyber war” after the KKK threatened to use“lethal force” against protesters in Ferguson, Missouri. 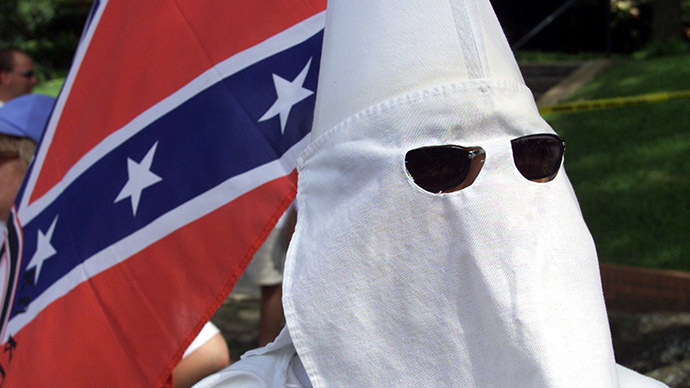 On Sunday night, Anonymous listed the KKK websites it had taken offline on its Twitter feed, with reports of the attacks accompanied by the hashtag #OpKKK. 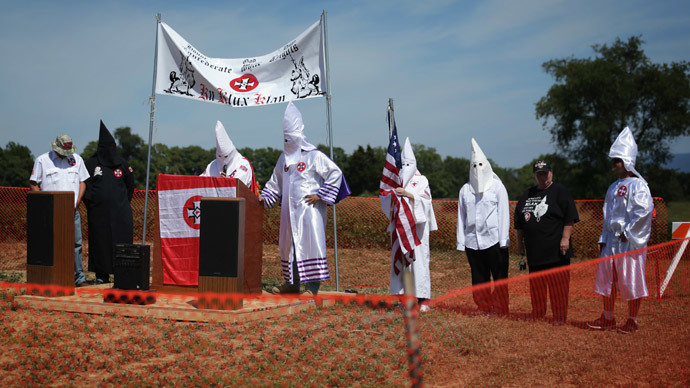 The group also said that information garnered from the seized Klan websites and Twitter accounts could help them unmask several KKK members, likely sparking the “we’re NOT HIDING” triad. 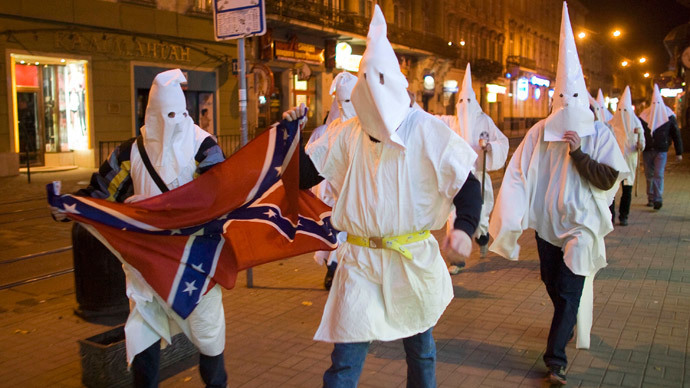 The hacktivists earlier claimed to have identified KKK members at a support rally for police officer Darren Wilson, who shot and killed a black teenager named Michael Brown in Ferguson, Missouri on August 9. There are fears further protests could erupt in Ferguson, with a federal grand jury set to announce its decision on whether or not to charge Wilson for the death of the unarmed teen.